Ramanathaswamy Temple is a famous Hindu temple dedicated to god Shiva located on the island of Rameswaram in the state of Tamil Nadu. It is one of the 275 'Paadal Petra Sthalams' ( sung about the kshetras by eminent saints), where the three of the most revered Nayanars (Saivite Saints), Appar, Sundarar and Tirugnana Sambandar have glorified the temple with their songs. The temple has the longest corridor among all Hindu temples in India.The temple is considered a holy pilgrimage site for the Hindus. The Temple is also one of the 12 Jyothirlinga temples, where God Shiva is worshipped in the form of a Jyotirlingam meaning "pillar of light". There are two lingams inside the sanctum. According to Ramayana, Sri Rama is believed to have prayed to God Shiva here to absolve any sins that he might have committed during his war against the demon king Ravana in Sri Lanka.To worship God Shiva,Sri Rama wanted to have a Shiva lingam. He asked Lord Hanuman to bring the lingam from the Himalayas. While it took longer for Hanuman to bring the lingam, Sita meanwhile had built a small lingam from sand for Sri Rama to worship. 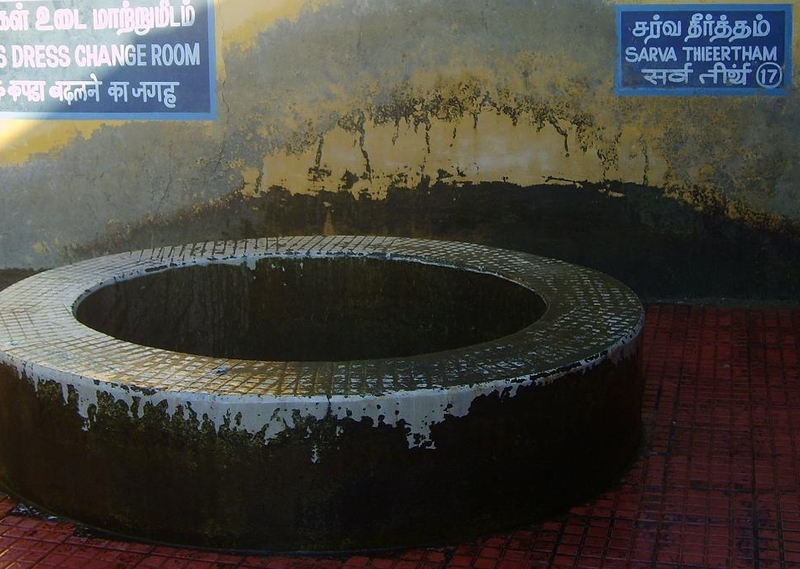 It is believed that the lingam in the sanctum is the one built by Goddess Sita, and is the main deity Ramalingam and the one brought by Lord Hanuman from Kailash is called Vishwalingam. Lord Rama had instructed that Vishwalingam should be worshipped first since it was brought by Lord Hanuman and the tradition continue even today, and hence it is customary that you visit this and worship this first. Like all heritage temples in South India,this temple is big with huge towers (Gopurams) at the east and west and gate towers on the north and south. The temple was expanded during the 12th century by Pandya Dynasty, and its principle shrines were renovated by Jeyaveera Cinkaiariyan and his successor Gunaveera Cinkaiariyan of the Jaffna kingdom. Among the many corridors in the temple, the outer set of corridors are said to be the longest in the world. Most pillars are carved with individual composition depicting various devathas and epic stories. There are sixty four Theerthas (holy water tanks) in and around the island of Rameswaram. Bathing in these Theerthas is a major aspect of the pilgrimage to Rameswaram and is considered equivalent to penance. 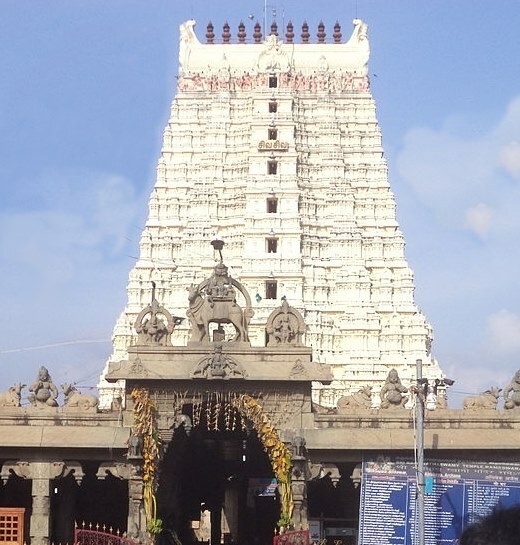 Twenty-two of the Theerthas are within the Ramanathaswamy Temple. It is beleived that the number 22 indicates the 22 arrows in Rama's quiver.The first and major one is called Agni Theertham which is Bay of Bengal sea. Mahalakshmi Theertham in the Hanuman Temple - Dharmarajan bathed here and became rich. Savithri Theertham in the west of the Hanuman Temple - King Kasibar got rid of his curse. Gayathri Theertham in the west of the Hanuman Temple - King Kasibar got rid of his curse. Saraswathi Theertham in the west of the Hanuman Temple - King Kasibar got rid of his curse. Sethu Madhava Theertham is the holy tank at the third corridor - One will get lakshmi's blessings and purification of heart. Gandhamadana Theertham in the area of the Sethumadhava Temple - One will get their sins absolved and get wealth and health. 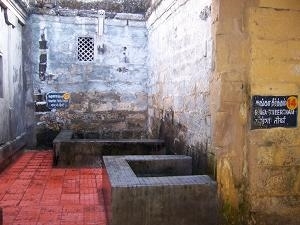 Kavatcha Theertham in the area of the Sethumadhava Temple- One will not go to hell. Gavaya Theertham in the area of the Sethumadhava Temple - Shelter under karpaga Virutchaga Tree. Nala Theertham in the area of the Sethumadhava Temple - One will get Soorya Thejas and reach Heaven. Neela Theertham in the area of the Sethumadhava Temple - One will get the benefit of Samastha(entire) yaga and receive Agni Yoga. Sanku Theertham in the inner corridor of the Temple - Sage Vathsanaba got rid of his sin of ingratitude. Sakkara Theertham in the inner corridor of the Temple - The Sun got His hand turned golden. Brahmahathi Vimochana Theertham in the inner corridor of the Temple - Brahamahathi was absolved of his sins. Sooriya Theertham in the inner corridor of the Temple - One will get the knowledge of the past present and the future and reach the worlds they want. 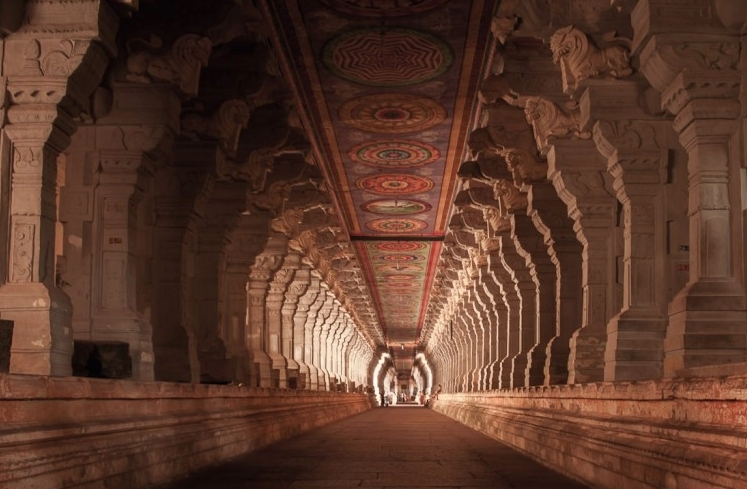 Chandra Theertham in the inner corridor of the Temple - One will get the knowledge of the past present and the future and reach the worlds they want. Ganga Theertham in the inner corridor of the Temple - Gananasuruthi Rajah attained wisdom. Yamuna Theertham in the inner corridor of the Temple - Gananasuruthi Rajah attained wisdom. Gaya Theertham in the inner corridor of the Temple - Gananasuruthi Rajah attained wishdom. Siva Theertham in the inner corridor of the Temple - Completion of Bhaira Brahmahathi. Sadyamirtha Theertham in the Amman Sannathi - Emperor Bururoonu got rid of his curse. Sarva Theertham in front of Lord Ramanatha's sannathi - Sutharishna got rid of his blindness,illness and old age and then he prospered. Kodi Theertham in the first corridor of the Temple - Sri Krishna got rid of his sin of killing his Kamsan. Holy Significance of the Temple The temple is one of the holiest Hindu Char Dham (four divine sites) namely Badrinath, Puri and Dwarka. The Advaita school of Hinduism established by Sankaracharya,attributes the origin of Char Dham to the Sankaracharya. The Char Dham of the modern days are Badrinath, Kedarnath, Gangotri and Yamunotri, all of these lie at the foot hills of Himalayas. These are called chota (small) Char dhams to differentiate the original Char Dhams. The journey across India to visit these holy places is considered sacred by Hindus who aspire to visit these temples once in their lifetime.Traditionally the trip starts at the eastern end from Puri, proceeding in clockwise direction. Temple location Rameswaram is a small town and the town has grown around the temple. Mahasivarathri during February-March is celeberated for 10 days in a big scale. 1) Rameswaram is an island and well connected with rail and road. The nearest airport is at Madurai. 2) There are plenty of state government buses from all over Tamil Nadu, and buses from Bangalore, Tiruvanthapuram are available. 3) If you are driving by your car, from Madurai it is around 3 hours and the drive is very scenic. the Pamban bridge is a must see. Beyond Rameswaram is Dhanushkodi, a town that was totally destroyed by a cyclone in 1960, you can hire a 4 wheeler and drive around to look at the ruins. Private cars are not allowed beyond a certain point. Where to eat? There are many eateries, but excercise caution. Being a tourist place, hygiene comes last here in many hotels. For those who love sea food and would like to venture there are many local restaurants serving the fresh catches. Other interesting places around RameswaramPamban bridge, Dhanushkodi ruins and beaches, Thangachi madam - a small fishing hamlet with beautiful beaches and light houses. You can hire a boat and venture out into the sea for few miles. Best Season: Throughout the year. Summer( from May to July) could be very hot and humid when the mercury shoots to 40 degree celsius.Avoid during monsoon months on July till September and partly on November, as it tends to rain heavily.